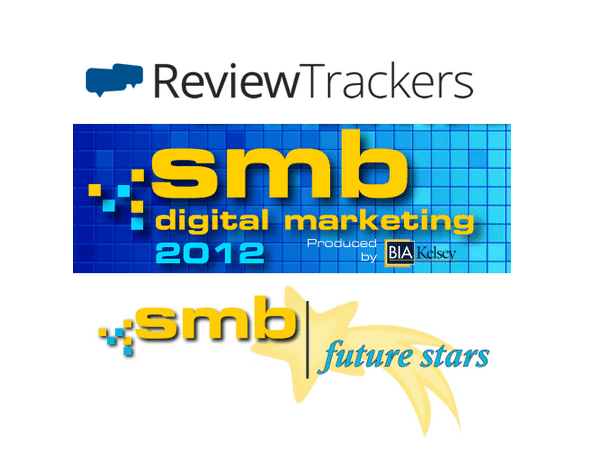 BIA/Kelsey’s highly-anticipated SMB Digital Marketing 2012 conference begins today, September 17, and we’re proud to announce that ReviewTrackers is featured as one of the SMB Future Stars! Chris Campbell, our awesome Chief Tracking Officer, joins hundreds of today’s leading innovators, entrepreneurs, local digital media executives, and strategists at the Hyatt Regency McCormick Place in Chicago, Illinois to talk about what’s next in digital marketing for small and medium-sized businesses. With over 450 attendees, representing more than 150 companies, and 40-plus speakers, the SMB Digital Marketing 2012 is a can’t-miss event for anyone with a stake in the local marketing industry. As an SMB Future Star, our online review monitoring solution ReviewTrackers joins other early-stage startups that are also poised to become the next big thing in SMB digital marketing: LocalBonus, LokalMotion, Pricing Engine, and the Snowshoe Stamp. The BIA/Kelsey SMB Digital Marketing 2012 runs for three days until September 19, and features a number of notable keynote speakers: Demandforce/Intuit CMO Patrick Barry, ConstantContact CEO Gail Goodman, Dex One CEO Alfred Mockett, ReachLocal President Nathan Hanks, Groupon Global Merchant Marketing VP Sanjay Gupta, and Facebook Partner Relations Manager Fred Huang. Stay tuned for more updates! Just click on the #SMBDigital tag on the RT blog to read about what’s happening with ReviewTrackers in Chicago. You can also follow us on Twitter via @ReviewTrackers or read our tweets tagged with #SMBDigital.